Disasters – natural or otherwise – don’t always strike at reasonable hours – and when an insistent pounding on the front door woke me from a deep sleep early in the morning of Friday, March 11, it wasn’t a reasonable hour. It was 1:30am and our neighbor had woken us to tell us about the hugely incomprehensible 8.9 (later revised to 9.0) earthquake in Japan — and to warn us of the massive tsunami headed our way. I then proceeded to try to figure out what was really going on — and what, if anything, to do about it. I pored over the tweets for credible news, first relieved that our good friends in Japan were safe, second reading about terrible devastation, in-between baffled by regular life apparently continuing with #ipad2 and #sxsw, and finally trying to parse the warnings about the West Coast of the USA, where I lay awake all night. On the Web beyond the tweets, I gaped at incredible maps with great red bands all up and down the coast of Northern California – red meaning “warning” – and “warning” apparently meaning, according to the automatically generated Tsunami information I could find, evacuate. While I tried to parse this information to figure out whether I did, in fact, need to pack my family up and ship out, the official word from San Francisco’s Department of Emergency Management was to “monitor local media for updates.” “Which local media would that be?” said SF friend @jamiedsongs. Good question. At SFGate, the Web site that backs San Francisco’s major newspaper the San Francisco Chronicle, the lights were on but there appeared to be nobody home. Though it had apparently been (automatically?) alerted to the major quake and tsunami, the front page was obviously stale to say the least, advising “no warning for CA coast” when the National Weather Service had already stuck us in the red “Tsunami Warning” category. Featured feeds were truly strange (live TV from Al Jazeera? Live blog from WSJ?) 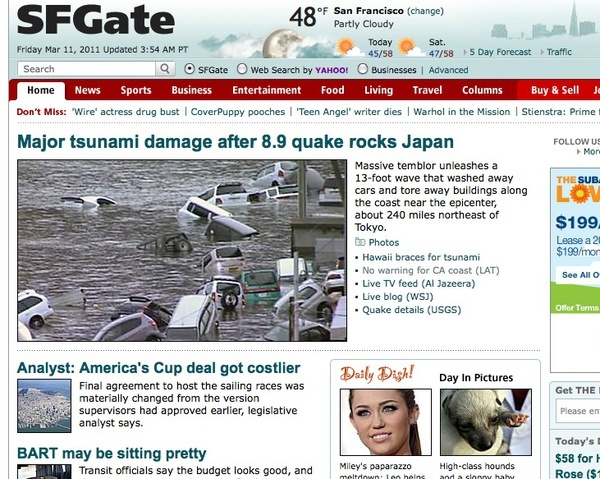 or virtually irrelevant (a quake details page leading to California earthquakes). Automatic news is often worse than no news at all. I desperately wished for the “local media” to wake up and interpret all of this. The only live person I found anywhere close to SFGate was featured columnist Jeanne Cooper, @Hawaii_Insider, who was putting out actual analysis in real-time and for whom I felt immensely thankful. At 4:49am San Francisco Mayor Ed Lee tweeted with a welcome voice of official authority, at last saying that although San Francisco had activated the Emergency Operations center, there was no evacuation ordered. But still the giant wave was coming. BART indicated they might close down entirely between peak Friday morning commute hours of 7-9am (or they might not), while waiting to see the extent of the hit on Hawaii (which was thankfully minimal) and then later Crescent City — which was not spared. 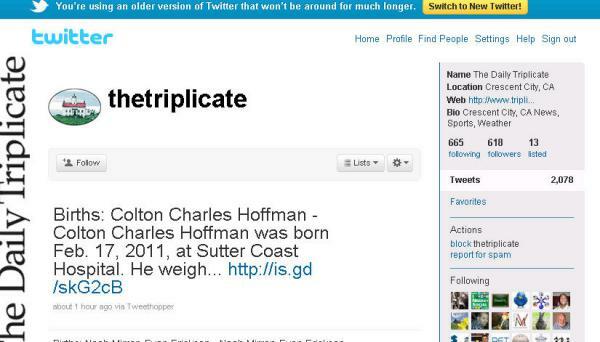 At the exact moment of tsunami impact in Crescent City, local newspaper the Daily Triplicate was apparently automatically chirping birth announcements (several weeks late), while thetriplicate.com Web site was down. In this age of information overload, I realized I knew where to go for tons information and in real time, but not where to go for the right, local information. It was a bizarre world online throughout the night, but bizarre was trivial compared to the real tragedies unfolding across the Pacific in Japan. The current big problem of information during disasters is that these places we rely on for local, up-to-date news, like all-too-often the cities themselves, are suffering economic woes. I don’t know much about Crescent City’s Daily Triplicate, but it’s likely to be in as much financial peril at the moment as its devastated harbor city itself. I remember everything about that day 20 years ago. It was a Tuesday. In the morning, Rebecca and I made plans to meet at Slim’s after work to buy tickets for the upcoming Phranc show. Then she went off on Muni downtown to her job, and I took a bus and walked to my job, at an architects’ office, on Townsend at 4th Street. On the top floor. In a brick building. On landfill. At 5:00pm, we were getting ready to leave work. I was sitting nearest the window to Townsend Street. My workmate Roxanne was sitting at a different desk across the room. Towards the entryway, there was a huge vase full of flowers against the wall, then the door to the emergency stairs, then the entry door. At 5:04pm the rumbling began. It was fairly strong but not long, and I heard it as much as felt it. I heard the sounds of the bricks, just a couple feet away, rumbling together — a sound I shall never forget. I hadn’t gotten under the desk by the time it stopped – but as soon as it stopped, it started again, with a vengeance. I looked over at Roxanne just as she dropped out of sight below her desk. I promptly dropped under mine. The noise and the shaking was so incredibly violent; I was holding my desk so it wouldn’t rock away; I was holding the desk drawers that were flailing out. I was trying to keep my typewriter — typewriter! — from jumping off my desk and hitting me. I might have even groaned somewhat. It went on forever — and yet it had all stopped only fifteen seconds later. Then there was silence. Which also seemed to last forever. But it must have only been seconds later that I found myself running down the emergency-lit stairwell the floor flights down to Townsend below. I’ll never forget (well, everything, obviously) the flower vase on my way out the door. The vase had lifted itself up and flown several feet, and laid there, a perfectly flattened smashed version of itself, flowers in tact, on the floor in my path. I never returned to that job and never saw Roxanne again. Outside, there was dust and heat and thick air. People were waiting in line at CalTrain phones (hard to believe – no cell phones, right!). I promptly thought of contacting my family, then about Rebecca. Was she stuck underground on Muni? Was she OK? I took off down Townsend towards our meeting point. There was a huge cloud of thick smoke coming from the Marina area. I think I had already heard rumours of the Bay Bridge having fallen down. Then, two blocks from my work, I reached 6th Street at Townsend. Down the short block, there was dust, there were a lot of people gathered, and there was a big pile of bricks. Somehow, I remember people were not moving very quickly — something I could hardly comprehend. I started towards the bricks; someone told me this: “You better not go any further; there are people buried under there.” Later I found out that five people died when the bricks had fallen on top of them as they were getting into their cars to go home. I started to feel sick and worried about Rebecca and I started running towards Slim’s at 11th and Folsom. Homeless people had sprung into action and, since there was no power, were directing traffic in the SOMA area. I was terribly relieved when I found Rebecca, leaning up against the wall at Slim’s, waiting for me just as we had prearranged. We had a beer at the Paradise Lounge on the corner and were watching a TV in there, that for some reason had power, when we figured we oughtta go see about our apartment. It was now growing dark outside. The long hallway to our apartment on the second floor in the (brick) Skyline Building at Church and Market was dark, and the smoke detectors were going “beep, beep, beep,” which they would regularly do for weeks to come every time power went out again, as seemed to happen with the biggest aftershocks. We pushed to open our door — at first, the door was stuck and we were freaked out that it was wrecked inside. But it was just the stowed-away mirror doors that had fallen and blocked our path. There were a lot of cracks inside and broken plaster, and our refrigerator door was open — but other than that we were in-tact. I made a quick call to my parents to tell them we were OK. Then friends arrived. Since we had a great central location, we were fortunate to have many visitors that night. Becky, who lived just across the street on 14th, came by. Later in the evening Lisa showed up — she worked in San Francisco and was waiting for the bus to take her back to Oakland when the quake hit. Others came by. It wasn’t until the next day that we heard where Becky’s roommate Angela was… Follow her blog for more on that. We went and stood in line at the corner store and bought canned beer, batteries, and white bread, which we ate in candlelight, while aftershocks continued to freak us out all night. That’s the basic story. There are many many strong memories in the shaky days, weeks, and months and years that came, such as standing in line for hours trying to give blood (when I was too faint by the end to donate), and being glued constantly to the TV (once the power came back on) to people I came to know as my guardian Angels, Pete Wilson and Anna Chavez. Every day for years after that — for as long as we lived in that apartment — I gazed at the leaves on the tree outside the window to see if they were moving. When there was still and calm, I was nervous. I craved the wind. 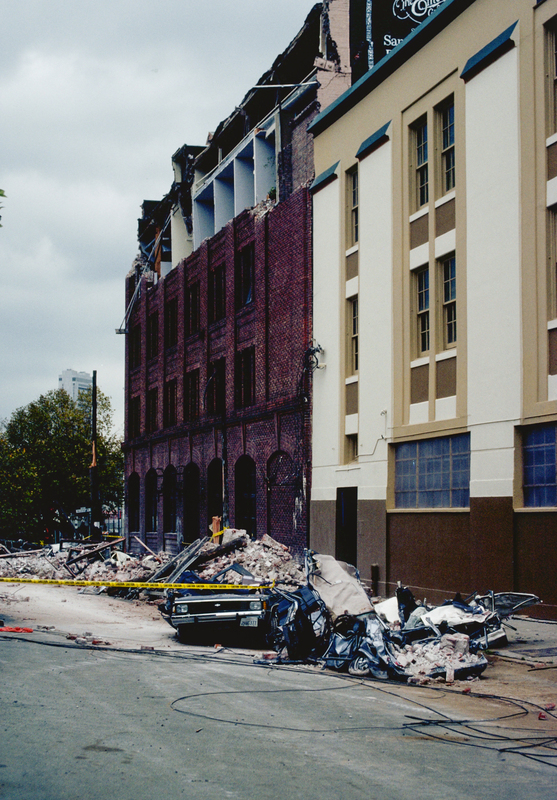 It was only 15 seconds those 20 years ago — and at 7.1, which somehow years later shrank to 6.9 on the Richter Scale, not nearly as big as some of the recent quakes we’ve seen worldwide. And in a pretty well retrofit city. Yet, those fifteen short seconds and the time that followed altered my own personal landscape, forever. As a result of those few 15 seconds, I am now permanently claustrophobic, a terrified flier, and nearly always consider what I’m driving over when I drive the Bay Bridge. To this day my heart sinks when there’s an earthquake, regardless of the size, especially in the middle of the night, because I don’t get back to sleep. I tune into the radio (and now Twitter more and more) to find community to pull me through till morning. On the other hand, I enjoy wide open spaces, I can usually tell you where the nearest exit is (along with all the other exits), and I value my friends and community so greatly. So I finally commit this to writing today, in deference to the memory of the Loma Prieta Earthquake in 1989, and to my friends and my community, and most of all, to the powers of nature — and of love. You know where I am. You can know at nearly all times. I am epicentered here. And I feel fine. The Internet is starting to focus on location in combination with feeling, and you can now often know not only where someone is, but how they are feeling. For instance, I can get on the Internet and tell the USGS where I was on Friday morning at 4:42am and exactly how much of the 4.2 earthquake I felt. Though not always mapped to precise physical location (but often so), on a recent roadtrip, I was able to Twitter about exactly where I was and what I was doing – as if the GPS in the car were not enough to track my whereabouts at all times. The most poignant lingering memory this represents for me is that that vacation is over. (Fear not – another begins next week!). You can even Twitter about earthquakes – though the chatter was decidedly light for Friday’s event. And if Twitter’s interface doesn’t cut it (and it doesn’t, to me), I can always go Jaiku. On http://www.wefeelfine.org, I can get an interesting feel for what people feel and where they feel it. Someone in Leipzig, for example, apparently feels detached. Someone in Florida feels sandy. I love to click around the happy dots and squares on this site. We can do things with this social environment, taking data from the entire collective memory visually of what the earth looks like, and link all of that together and make something emergent that’s greater than the sum of the parts. “A ‘long tail’ model of the entire Earth,” they say. Female dispatcher: Can I ask you something? Female Dispatcher: Did you have something going to Sixth and, what is it, Townsend? Female Dispatcher: We ordered it a little while ago. Just wondering if you had one. CEH: I don’t see Sixth and Townsend. Female Dispatcher: Okay, hold on. (keying police radio transmitter) Unit requesting Sixth and Townsend 408? an ambulance. Boy 103, did you have a Sixth and Townsend request? Boy 103: 10-4. That’s best way to get in there is Sixth and Townsend, and the Fire Department and police will direct them to where the injured parties are… (Boy 103 is then covered by an unidentified officer who says) They had requested two ambulances. Female Dispatcher: What’s the level of injury, because they have their lists of priorities up here too. They’re going crazy. Unidentified Police Unit: It’s going crazy out here. Female Dispatcher: Yea, what kind of injury? (no answer in few second so she says to CEH dispatcher on phone) Okay, well, Sixth and Townsend, you know, put it on there definitely. They had requested two ambulances. Female Dispatcher: Okay, so, I don’t know. Try…try middle priority. CEH: Sixth and Townsend, Code 2. All right. I walked right by the incident to which they refer. It was super scary. The Internet at its best could really be able to help our communities during times of disaster. While I don’t look forward to those, I look forward to that community, hopefully, being there for us – wherever we are and however we feel. there is such a fogstorm in the city today. it is grey and windy; it has swallowed us all up. mistakenly, sometimes i say how beautiful it is to tourists who only have a fog day to experience the golden gate bridge. most people who go to the bridge for the first time would prefer to see it in its entirety, and i guess i can understand that. i love the fog. the fog is alive; it creeps down in the carpet over the hills, turns twin peaks into water, is gorgeous from far away, and occasionally engulfs the previous understanding of the day. perfect for when you want to sleep till four, and don’t want to feel disoriented when you finally go out into the day. difficult for tourists. and alas, i missed the ferry plaza farmer’s market today; i had wanted to see jessica prentice on stinging nettles. but the ferryplazafarmersmarket will be there still next weekend, and we are lucky. leanne sent along a wonderful newsletter from a place called two small farms, in which they sang the praises of organic milk, particularly straus. i feel so fortunate we can choose local, organic foods. the days i ride the train, i usually take the paper along and read things that make me glad, or more often, upset. then, i am unusually chatty about current events at the end of the day, and leanne is quite tolerant. the other day, i came home demanding to know why it was so important that companies continue to turn growth year after year, and wasn’t that not going to be sustainable in the long run. that’s quite tame in comparison to what democracy now does to me. for those days when i do drive, and i take my time enough to leave near nine and have a little more road to myself, and for when i’m feeling strong enough for it, i tune in to amy goodman and try to feel energized rather than demoralized by all the violations of social justice in the world, usually in the name of democracy and usually by the united states. yesterday, i was thusly blown away by the segment in which they discussed “U.S. Threatens to Withhold AIDS Drugs from African Countries That Bar Genetically Engineered Foods”, amongst other things. food sustainability, “food sovereignty”, preservation of genetic diversity all seem so crucial to our continued existence, but corporate control, transgressions, and greed just keep pushing and pushing and winning, it seems. against the giants on this playing field — monsanto, dow, novartis, dupont — and bayer, lovely bayer — what can one person do? sometimes, i’m just relieved to crawl right back home under the fog bank. 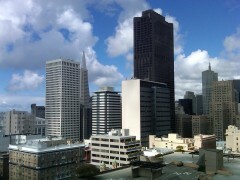 certainly, every evening i come home to san francisco, i am relieved to be living in this city. and sometimes, sometimes there are positive things that happen, that make it all worthwhile. 90-year-olds and babies together in the streets after the bombing starts; amy goodman working to bring the information; ruth ozeki, barbara kingsolver; the center for food safety; rainbow grocery; jardiniere… ; all the local, organic farmers gardeners and otherwise foodmakers that bring organic foods every weekend to the ferry plaza… the heroes at my table. and the fog, the lovely fog, thrown in just to keep things beautiful. and these days, after all, it seems like the best things that can happen are those where exactly one person does make all the difference. i only need to look at one of my favorite heroes, todd smith, to remember that. thank you for always helping me remember that, todd. no sooner had i hit the ‘post’ button than we had an earthquake. in my memory, it was actually perfectly timed to hitting “post and publish”. it got me up to the doorway… a jolt; they are saying near santa rosa. this is when the san francisco a.m. radio heroes come to the rescue. only i seem to remember them keeping callers on much longer; all night long. now, they just sprinkle updates into the sports, financial news, traffic, business as usual… perhaps this is just not as big as those other times i remember. but i do remember… oh boy i do. moyawatson on could i be allergic to JICAMA? Candice on could i be allergic to JICAMA?